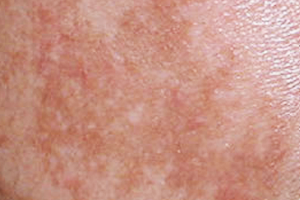 When melasma (chloasma Syn, pregnancy spots) is seen on the face, large-scale, brown, gray-brown spots are caused by increased synthesis of melanin (pigment). Melasma is usually caused by taking certain birth control pills due to UV exposure or ingestion of certain drugs during pregnancy. 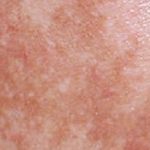 How can you treat a melasma and / or other brown spots? One of the most important measure is the avoidance of further UV radiation, usage of sunscreens with a high sun protection factor and disconticuation of contraceptives or other medication that can cause it. The important home treatment is included by daily application of bleaching and lightening creams or lotions, with agents such as hydroquinone, vitamin A acid, fruit acids, kojic acid, mulberry (white mulberry), etc. The chemical peel is performed in an outpatient practice with us. It may be combined with mechanical peeling or laser treatment. Usually it takes 3 to a maximum of 10 sessions, depending on the severity of the skin disorder. After the first session an improvement is usually already visible, occasionally accompanied by a discrete redness or scaling. The redness will disappear within 48 hours, occurs when the scaling between the 3rd to 5th day. But these effects can be easily concealed with a make-up. The treatment success is usually after the 2nd to 3rd session.